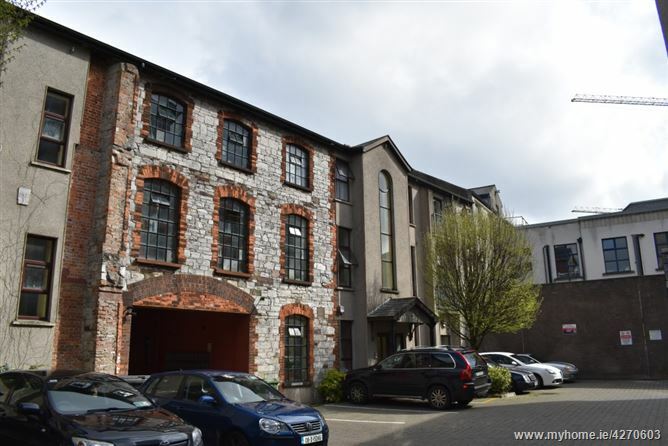 ERA Downey McCarthy are excited to launch to the market this splendid, 3-bedroom second floor apartment in a sought-after central location adjacent to Washington Street and within convenient walking distance of UCC. The property is presented in excellent decorative order and includes many original features plus a balcony overlooking a central courtyard area. Spacious entrance hallway with timber floor covering, storage heater, and shelved hot-press. Attractive living / kitchen / dining area with generous accommodation and finishes to include a sliding patio door to balcony, full length curtains, tiled floor, 3 ceiling light fittings, storage heater, t.v point, 11 power points and floor & wall mounted fitted units finished in white. The kitchen also includes a washing machine, electric hob & oven and fridge. A spacious double bedroom with one window overlooking the rear courtyard. This room includes timber floor covering, curtains, built-in wardrobe, wall mounted electric radiator, centre light fitting and two power points. A large double bedroom with one window overlooking Hanover Street. This room includes built-in wardrobe, timber floor covering, curtains, wall mounted electric radiator, centre light fitting and 2 power points. An attractive double room with one window overlooking Hanover Street. This room includes built-in wardrobe, timber floor covering, curtains, wall mounted electric radiator, centre light fitting and 2 power points. bathroom suite in white and a Mira Elite QT electric shower over the bath. Gross internal floor area 58.97 sq.m. (635 sq.ft.) approx.